Gold is currently testing the lower limit of its medium term bullish channel in 1706 suggesting a rebound. However a break of these levels would free a large potential of drop and initiate a new trend. According to previous events, the market indicates a bullish opportunity on the levels of 1706 with a 1st objective of 1722, then 1733. A break in 1703 would invalidate this scenario. Salam..sejahtera semua... hari ni saya nak cerita tentang jual emas pula.. Tradisionalnya, kita akan jual emas pada harga semasa yang tinggi. Jadi perbezaannya iaitu ( harga jual - harga beli) keuntungan jualan emas. Beralih pada topik, dan seperti saya maklumkan kelebihan forex gold sebelum ini.. kita boleh mendapat keuntungan membeli atau menjual..
Contohnya.. kita ada membeli emas pada harga 1700, sebulan lepas itu harga berada di paras 1900. Dan kita mendapat info..sebuah syarikat besar telah menjual emas beliannya untuk mendapatkan keuntungan. Jadi kita boleh close position buy kita dan boleh menunggu masa untuk sell gold pula. Info tersebut boleh menyebabkan orang ramai akan jual emasnya juga dan menyebabkan harga pasaran emas jatuh. Gold is currently testing the upper limit of its medium term bullish channel in 1752 suggesting a decline. However a break of these levels would free up significant potential and initiate a new trend. According to previous events, the market indicates a bearish opportunity on the levels of 1752 with a 1st objective of 1740, then 1735. A break in 1755 would invalidate this scenario. 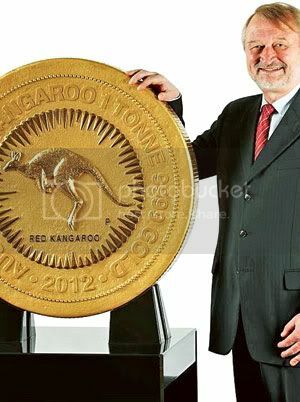 PERTH - Kilang duit siling Perth Mint di Australia semalam memperkenalkan sekeping duit siling emas yang didakwanya terbesar di dunia. Siling emas berkenaan memiliki berat lebih satu tan dan bernilai sekitar AS$55 juta (RM171.8 juta). Sebelah siling itu tertera gambar seekor kanggaru sedang melompat. manakala sebelah lagi memiliki profil ketua negara Britain, Ratu Elizabeth II. Siling emas itu diperkenalkan sempena sidang kemuncak negara-negara Komanwel yang akan dirasmikan oleh Ratu Elizabeth II di sini pada minggu ini. Siling gergasi seberat 1,012 kilogram itu mengandungi 99.99 peratus emas tulen. Lebar siling itu hampir 80 sentimeter (sm), sementara tebalnya ialah 12sm. Kilang wang tersebut mengambil masa 18 bulan untuk menghasilkan siling tersebut yang kini dipamerkan kepada orang ramai. Gold is currently testing the intermediate support of its medium-term bullish channel in 1720 suggesting a rebound. However a break of these levels would entail a return to the lower limit of its channel to 1710. According to previous events, the market indicates a bullish opportunity on the levels of 1720 with a 1st objective of 1730, then 1735. A break in 1718 would invalidate this scenario. Gold has broken yesterday the intermediate resistance of its medium-term bullish channel in 1646 leading to an acceleration. A pull back on these levels is expected before a resumption of bullish. According to previous events, the market indicates a bullish opportunity on the levels of 1646 with a 1st objective of 1660, then 1665. A break in 1643 would invalidate this scenario. Gold is currently testing the intermediate resistance of its medium-term bullish channel in 1648 suggesting a decline. However a break of these levels would allow it to reach the upper limit of its channel to 1702. According to previous events, the market indicates a bullish opportunity as soon as the gold will have broken its resistance in 1648 with a 1st objective of 1660, then 1665. A break in 1645 would invalidate this scenario. Gold is currently testing the lower limit of its medium term bullish channel in 1604 suggesting a rebound. However a break of these levels would initiate a new trend. According to previous events, the market indicates a bullish opportunity on the levels of 1604 with a 1st objective of 1627, then 1632. A break in 1601 would invalidate this scenario. The spot gold prices, failed to move above the resistance level at 1701.50 dollars (weekly resistance), which limits the time to rise. Forex traders should note that a break below $ 1,594 could open the door to go back again, at least $ 1,530 in September and continue to fall to 1450 dollars an ounce. However, this level of 1594 dollars in the price of gold, is a good point of enter for a bullish position, we are very vigilant because at this level may be a rebound, we must be careful about buying positions, can be increased positions as the price level to rise, the stop loss level, place it just below 1590 dollars an ounce. . Our short term goal we will place in 1755 dollars for an ounce of gold. The gold is currently testing the intermediate resistance of its medium-term bullish channel in 1665 suggesting a decline. However a break of these levels allow it to reach the upper limit of its channel to 1700. According to previous events, the market indicates a bullish opportunity as soon as the gold will have broken its resistance in 1665 with a 1st objective of 1675, then 1680. A break in 1663 would invalidate this scenario. Salam dan selamat pagi semua pengunjung blogisemas, hari ni saya nak cerita tentang chart pattern di chart gold minggu ini..
pattern ini lebih kurang macam rising wedge dan target arah selepas itu adalah ke bawah... jd saya pun kurang pasti apakah pattern ini... aperpun saya akan predict arah ke atas sahaja,,,,kita tunggu la aper yang terjadi.. The gold is currently testing the lower limit of its medium term bullish channel in 1665 suggesting a rebound. However a break of these levels would release a large potential of drop and initiate a new trend. According to previous events, the market indicates a bullish opportunity on the levels of 1665 with a 1st objective of 1680, then 1685. A break in 1662 would invalidate this scenario. Gold is currently testing the upper limit of its medium term bullish channel in 1700 suggesting a decline. However a break of these levels would free up significant potential and initiate a bullish trend more violent. According to previous events, the market indicates a bullish opportunity as soon as the gold will have broken its resistance in 1700 with a 1st objective of 1720, then 1724. A break in 1697 would invalidate this scenario. Gold is currently testing the iontermediate support of its medium-term bullish channel in 1655 suggesting a rebound. However a break of these levels would entail a return to the lower limit of its channel to 1610. According to previous events, the market indicates a bullish opportunity on the levels of 1655 with a 1st objective of 1672, then 1680. A break in 1652 would invalidate this scenario. Gold is currently testing the intermediate resistance of its medium-term bullish channel in 1695 suggesting a decline . However a break of these levels would allow it to reach the upper limit of its channel to 1716. According to previous events, the market indicates a bullish opportunity as soon as the gold will have broken its resistance in 1695 with a 1st objective of 1710, then 1715. A break in 1692 would invalidate this scenario. Gold is currently testing the upper limit of its medium-term bullish channel in 1686 suggesting a decline . However a break of these levels would allow it to initiate a bullish trend more violent. According to previous events, the market indicates a bullish opportunity as soon as the gold will have broken its resistance in 1686 with a 1st objective of 1700, then 1705. A break in 1684 would invalidate this scenario. Salam dan selamat sejahtera semua... khusus pada yang menyinggah blog saya ini...Hmm pening jugak nak menulis info tentang gold ini. Walaubagaimanapun, saya akan terus update teknikal analisis gold setiap hari. Ok.. entry sebelum ni saya ada cerita sedikit jer tentang online gold trading iaitu trade gold di platform forex. Pemberian leverage yang tinggi bermaksud, anda boleh menggunakan modal rendah membuka akaun forex dan trade di platform forex. Dengan setiap 0.1 lot anda boleh trade gold sebanyak $16500 di platform forex. Broker menjadi pilihan saya untuk trade gold adalah di Instaforex . Terms short bermaksud sell dan long bermaksud buy. Dalam trading gold di forex, anda boleh samaada beli dan jual emas pada harga tertentu berdasarkan analisa masing-masing. Anda juga boleh membuat keuntungan dengan menjual harga emas jika harganya jatuh. Gold is currently testing the intermediate support of its medium term bullish channel in 1628 suggesting a rebound. However a break of these levels would entail a return to the lower limit of its channel to 1601. According to previous events, the market indicates a bullish opportunity on the levels of 1628 with a 1st objective of 1645, then 1650. A break in 1625 would invalidate this scenario. Gold is approaching the upper limit of its medium term trading range in 1676 suggesting a decline. However a break of these levels would free up significant potential and initiate a new trend. According to previous events, the market indicates a bullish opportunity as soon as the gold will have broken its resistance in 1676 with a 1st objective of 1690, then 1695. A break in 1674 would invalidate this scenario. Salam Satu Malaysia... terima kasih yang mengunjungi blog saya ini... Hari ni saya nak membawa topik aku dan gold.. Hehe tiada persamaan pun aku dan gold ni,,, cumer awal minggu ni.. ader panik dan geram skit tentang turun naik gold dalam trading aku.. Hmmm.. tak faham lagi.. ok aku akan terangkan dalam bentuk bergambar so harap jelas la yer..
Ok pada minggu ni pergerakan harga emas naik pada mulanya..dan kemudian jatuh,, pada paras 1600 semula..hmm.. nak jadi kan cerita.. floating saya positif pada awalnya... dan mengharap price gold akan naik lagi.. pada price resistance area 1675.00.. tetapi jatuh pada area itu,,, dan kemudianya,,,, jatuh sehingga semua trade saya floating negatif,,, itu yang hangin n panik.. saya terpaksa topup skit utk jaga margin.. rasa menyesal plak hold pada paras itu...takper la takder rezeki..
GOLD moved modestly higher in US trade last night and looks set to post solid gains in the com-ing weeks as a base has now been set and a bullish sign is the rise in equities, confidence and a weaker USD. All of these factors will support gold prices in the coming weeks and months ahead. Gold finished US trade higher by 0.70% at $1,653. Silver was the real winner last night as European debt woes subsided and investors finally took on board risk which added more upside to Silver than Gold as it is more tied to economic growth and demand. We remain firmly bullish and long of Gold at a few levels and buy again above $1,679. Stops remain at $1,595 for now until we breach the recent highs above $1,679. Only a move back below $1,595 will signal all is not well with gold prices and we could be set to test major support at $1,550 again. We do not see this as likely and remain buyer into weak-ness targeting $1,725/35 next week. Expect con-solidation in Asia and a $1,636-60 range with a downside bias in Asia as consolidation and profit taking sets in. Gold is currently testing the intermediate resistance of its medium-term bullish channel in 1651 suggesting a decline. However a break of these levels would allow it to reach the upper limit of its channel to 1681. According to previous events, the market indicates a bullish opportunity as soon as the spot rate will have broken its resistance in 1651 with a 1st objective of 1661, then 1665. A break in 1649 would invalidate this scenario. Gold is currently testing the intermediate resistance of its medium term trading range in 1636 suggesting a decline . However a break of these levels would allow it to reach the upper limit of its trading range to 1677. According to previous events, the market indicates a bullish opportunity as soon as the gold will have broken its resistance in 1636 with a 1st objective of 1646, then 1650. A break in 1634 would invalidate this scenario. LONDON, Oct 4 (Reuters) - Gold prices surrendered early gains on Tuesday to swing lower, caught up in hefty losses across the financial markets, as heightened concerns over the prospect of a Greek default prompted a sharp slide in equities and commodities. European shares fell 3.3 percent, oil prices slid more than $2 a barrel and industrial metals like copper and nickel saw selling on growing fears the euro zone sovereign debt crisis could be spreading to the banking sector. Spot gold was down 0.2 percent at $1,652.80 an ounce at 1242 GMT, having earlier risen as high as $1,678 an ounce. Investors remained wary towards gold after it was caught up in a financial market rout in late September, which saw heavy selling of the metal to cover losses elsewhere. Prices fell 20 percent from the record $1,920.30 hit early in the month. "Against a sea of red, (gold) probably will continue to struggle, as its safe haven (appeal) has been somewhat put into question over the last month," said Saxo Bank senior manager Ole Hansen. "Further losses on the S&P, which are now likely considering how we are testing recent lows, could trigger addional long liquidation of profitable positions." "Gold has done pretty well considering the continued dollar strength," he added. "But it is probably also clear that following a $300 dollar correction, many are a bit hesitant jumping back in." European shares took another hit on Tuesday on fears Franco-Belgian bank Dexia may need to be rescued due to its exposure to Greek debt. Investors fear this is evidence that banks will be hit hard by the euro zone sovereign debt crisis. European finance ministers are considering making banks take bigger losses on Greek debt and have postponed a vital aid payment to Athens until mid-November. The STOXX Europe 600 Banking Index is down nearly 5 percent. Despite putting in its weakest performance in nearly three years in September, gold still managed to deliver its biggest quarterly gain of 2011 in the third quarter, and is up more than 15 percent so far this year. This is even after some gains in the dollar, which has inched up 1.4 percent this year versus the euro. Gold is usually pressured by a stronger dollar, which makes it more expensive for other currency holders. U.S. gold futures GCv1 for December delivery were down $2.50 an ounce at $1,655.20. Among other commodities, oil and industrial metals such as copper and nickel fell as worries over the economic outlook hurt demand expectations for raw materials. Goldman Sachs reiterated its 12-month gold price target of $1,860 an ounce, at the same as it cut its 2012 forecasts for oil and copper prices. "As we expect gold prices will continue to be driven in large measure by the evolution of U.S. real interest rates and with our U.S. economic outlook pointing for continued low levels of U.S. real rates in 2012, we continue to recommend long trading positions," it said. Credit Suisse also raised its 2012 gold price forecast to $1,850 an ounce, saying the metal, as a clear beneficiary of the uncertainty and dislocations in financial markets, has further upside with the crises set to continue. Silver prices were up 0.2 percent at $30.39 an ounce. Spot platinum was down 1.2 percent at $1,478.99 an ounce, while spot palladium was up 1.2 percent at $586.97 an ounce. Platinum widened its discount to gold to nearly $200 an ounce in earlier trade, an unprecedented level, while the gold:platinum ratio -- the number of platinum ounces needed to buy an ounce of gold -- rose to 1.13, its highest since Reuters data began. Platinum prices were hurt by a 29 percent hike in CME Group trading margins on platinum futures, as the biggest operator of U.S. futures exchanges moved to tame market volatility. "Major automakers posted double-digit percentage U.S. sales gains for September.... (but) September car sales in Italy and France were weak, offsetting gains in Germany," said HSBC. Gold approaching to the upper limit of its medium term bullish channel in 1778 suggesting a decline. However a break of these levels would allow it to initiate a bullish trend more violent. According to previous events, the market indicates a bullish opportunity as soon as the gold will have broken its resistance in 1778 with a 1st objective of 1790, then 1795. A break in 1776 would invalidate this scenario. Gold is currently testing the intermediate support of its medium-term bullish channel in 1625 suggesting a rebound. However a break of these levels would entail a return to the lower limit of its channel to 1610. According to previous events, the market indicates a bullish opportunity on the levels of 1625 with a 1st objective of 1637, then 1640. A break in 1623 would invalidate this scenario. Salam.. terima kasih kerana ada yang sudi "lepak" kat blog baru saya ini .. kali nak share aper plak yang best tentang silver (perak). Silver juga mempunyai nilai berharga selain emas. Silver dijadikan bahan2 perhiasan dan kemas seperti rantai, cincin, peralatan letrik dan tampalan gigi. Tidak banyak mana pun warna2 emas ni yang kita pernah lihat.. Emas kuning dan emas putih kan... klw ada yang korang pernah lihat warna lain bagi tahu la yer..
Kita tahu warna tulen emas adalah kuning. Akan tetapi emas tulen ini terlalu lembut untuk perhiasan barang , ianya perlu dicampur dengan logam yang lain untuk meningkatkan kekuatan. Contoh barang perhiasan yang dicampur dengan emas seperti tembaga, zink dan perak..pladium dan nikel. Platium, pladium, dan nikel ni pula adalah bahan campuran utk menghasilkan emas putih. So campuran bahan2 seperti ini yang membuatkan emas putih lebih mahal dari emas tulen tp harga jualan balik emas putih ni rendah..
Kita pernah juga dengar terdapat pengguna alah dengan emas putih biasanya yang alah guna emas putih campuran nikel. Emas putih jenis pladium lebih mahal berbanding dengan emas tulen n emas putih campuran yang lain. Tetapi tidak semahal emas putih campuran platium.